In 2005, I found myself inside a Catholic church for Midnight Mass. My future wife, born and raised in the Catholic Church, was by my side, silently showing me something that I never thought I’d see or feel. At the age of 31, an unexpected realization set in – thus beginning my personal journey to the Catholic Church, my home. Peering back into my childhood, however, I realize that my exposure to Catholicism actually began as a child. My father was in the Army so our family traveled around quite a bit. I was born in San Francisco, California, where my father was stationed in 1974. Both of my parents are “cradle” Catholics and each had very different experiences with the Catholic Church. Throughout the various moves from place to place, my parents were contacted by Jehovah’s Witnesses. The Watchtower message touched my parents enough to eventually become baptized Jehovah’s Witnesses in 1984. Growing up as a Jehovah’s Witness was difficult at times, but it was also very rewarding. As a child, I felt a part of something much larger than myself, than the world, than my parents. I felt a part of an organization that seemed to truly care for me and my family and that was teaching me “the truth.” Standing up for my beliefs as one of Jehovah’s Witnesses made me feel good inside, knowing that I was being loyal to my God. I learned Scripture quickly and, at a very young age, I began to give “talks” (sermons) in front of the congregation. My heart was drawn to go out publically from door-to-door preaching this “good news” that I was learning. I just loved meeting new people and teaching them the things that God was teaching me! Thus, in 1987, at the age of 13, I was baptized as an ordained minister in the Watchtower organization as one of Jehovah’s Witnesses. As we all know, the teenage years are a difficult time regardless of one’s religious views. Mine were no exception. Inquisitive as most at my age, I began to question many of my beliefs. Questions like, “How do we know that the Watchtower Society, Jehovah’s Witnesses, is the only true religion?” and “Why is it that the history of Jehovah’s Witnesses only goes back so far, thus creating a huge gap in the connection to the Apostles?” These and many other questions began to truly eat away inside me at a very young age. The difficulty with having such questions as a Jehovah’s Witnesses is that a person who begins to ask such questions is then “marked” by the church as a “bad association,” or even reprimanded for questioning the organization. So I held all these questions, along with many more concerns I had, deep inside. Feeling that I had nowhere to go, I turned to drugs and alcohol at the age of 15. My life spun out of control for a good year. I began to completely withdraw from the Watchtower, my friends, and more importantly, God. I began to self-medicate, hoping all of the questions would be answered. Fortunately, I had a good enough relationship with my parents to eventually talk to them about this substance abuse issue I had created for myself. I truly desired to get back in the good graces of my God and my family. It is common practice among Jehovah’s Witnesses to confess things like this to the Elders of the congregation and, with the encouragement of my parents, I did so. What resulted was a disciplinary action called “Private Reproof,” which limited my responsibilities in the congregation, including praying publically, reading Scripture in front of the congregation, and giving sermons. While I understood principle of the discipline, I was truly distraught knowing I could not serve my congregation. However, I took this time to try and strengthen my relationship with God and my family. Fortunately, I was able to overcome my battle with drug abuse and my responsibilities in the congregation were restored. Over the next several years, I dedicated myself to the Watchtower. I became a “Full-time Pioneer” (minister) at the age of 18, was appointed a “Ministerial Servant” (Deacon) in my 20s, and had many responsibilities in the congregation. Through it all, however, it seemed like something was missing – there was an emptiness growing inside me. This feeling always concerned me and I feared telling anyone about it, so I prayed about it constantly, hoping for an answer. In 1994, I married a sweet, Jehovah’s Witness woman whose desire to serve seemed to match mine. We both served the congregation as much as we could. We met many wonderful people and gained so much joy through service! However, that empty feeling still existed within me. I had so many lingering questions about my religion that just did not seem to have plausible answers. A couple of years later, in 1996, my wife gave birth to our beautiful son. He just lit up our world and helped me make a decision that would change my life forever. The birth of our firstborn made me realize that I needed to do something with this empty feeling, with these questions that haunted me for years. I decided to take a break from my responsibilities in the congregation for a while and instead focus on research. I totally engulfed myself in nothing but the Bible and its history. I stopped attending the meetings at the Kingdom Hall, and prayed harder than I have ever prayed. My prayer was that God guide me in the right direction and fill this emptiness inside of me. The Elders in my congregation did not welcome this break. One morning I received a call from an Elder of our congregation, a dear friend of mine. It also happens that he was serving at “Bethel” (the Watchtower headquarters in New York). He expressed his concern for me and my spirituality. He offered to help me in any way he could and asked is he could make a home visit. Of course, I understood his concern for my spirituality because I was concerned about it myself, so I accepted his offer. His visit would be a pivotal point in my journey. The day came for the long-awaited visit — I was very excited to see my friend! Initially we sat and chatted about some lost time, drank some coffee, and just enjoyed each other’s company. The subject then switched to me and my spirituality. I expressed my feelings and the questions that I had been pondering. I also confessed my fear of sharing these things, because I didn’t want any negative recourse as a result. He seemed to understand and wanted to help answer any concerns I had, in hopes to strengthen me. This was a relief for me! Feeling safe, I then began to pour out every concern I had and described the empty feeling I had inside for years. We discussed the apparent conflicts between Scripture and the teachings of the Watchtower Society. He listened to everything I was feeling. It felt as if a load was lifted off my shoulders! I thanked him for visiting, we hugged, and he left. This was the last time I spoke with or saw him again. A week later, I received a phone call from another Elder informing me that, because of my views, they had decided to “disassociate” (ex-communicate) me from the organization. He stated that because of the questions, concerns, and views that I expressed to my Elder friend, I had made it clear that I no longer wanted to be one of Jehovah’s Witnesses. This decision on the part of the Elders devastated me! By disassociating me from the organization, my parents, brother, sister, and all of my friends (ones I have known since I was a child) were no longer allowed to speak to me or visit with me at any time. That empty feeling — that hole — just got larger. I was spiritually alone. Over the next several years, in my desolation, I became angry at organized religion as a whole – in particular Jehovah’s Witnesses. I dabbled in paganism, Hinduism, Buddhism, agnosticism, and eventually just gave up and began feeling there was no God and began to study atheism. In attempting to fill the empty feeling, I just made it larger and larger. In 1999, a beautiful baby girl was added to our family and she brought so much joy into my life! I sat back and saw this picture: I had a nice home, was married with two beautiful children, and I was alive. So why was I so unhappy? Why did I still have this empty hole inside? I couldn’t understand it. I became more angry and resentful. I began to drink alcohol heavily and dabble in marijuana. I joined a metal-rock band and became part of the music scene — all in hopes of filling this void. As happens many times due to behavior like this, my marriage fell apart. In 2004 I found myself divorced, living alone, and only seeing my children every other weekend. It was all gone. I was empty and alone. In March of 2005, I met a woman named Sherri who would change my life. We seemed to have similar interests, so we began dating. I quickly saw that she was deeply inclined toward God. While she didn’t talk much about her religious beliefs, she showed them to me in almost everything she did. It wasn’t long before I brought up religion with her, since her unspoken faith had intrigued me. When she told me she was Catholic, I thought to myself, “Of all religions, she HAD to be Catholic!” This feeling came from my roots as a Jehovah’s Witnesses since they are extremely anti-Catholic. However, after getting to know Sherri, I fell in love and proposed marriage. I found myself going along with her through the pre-Cana program so we could get married in the Catholic Church. I also went through the annulment process. Again, I wasn’t too sure about all of this, but it made Sherri happy, and that was what I wanted. From the first meeting we had with our priest, Father Toomey, I was truly impressed. He shared with me his journey to the priesthood and had extensive discussions with me on my views and my experiences with Jehovah’s Witnesses. I even told him about the emptiness I felt inside. I couldn’t believe that he didn’t judge me for my questions and concerns! He just listened, smiled, and understood. During one of our discussions, Fr. Toomey said that he wanted to give me a gift that he thought I would enjoy. He handed me a book entitled, The Teaching of Christ – A Catholic Catechism for Adults. He said, “You may not decide to read it right away, and that’s okay. But I thought of you and wanted you to have it.” I accepted this book as a kind gesture. When I got home, I placed it in my nightstand and forgot about it. With Christmas around the corner, I was getting excited to spend it with Sherri. Sherri mentioned to me that she wanted me to go to Midnight Mass on Christmas Eve. At first, I was taken back with hesitation because of my disdain for organized religion. However, I didn’t want to disappoint Sherri, so I accepted her invitation. While it was difficult for me at the time, I admitted to Sherri that the Midnight Mass was one of the most inspiring things I have ever encountered! In December of 2006, Sherri and I were married at St. Matthew Catholic Church and it was an amazing day! Our journey brought us there that day and Father Toomey performed the ceremony exquisitely. In 2009, during a night out with friends, I became extremely intoxicated. I blacked out while walking, fell and hit my head, and suffered a Grade 3 concussion. The doctors told me I was lucky to be alive, since my blood alcohol level was 1.11 when they measured it the morning after the accident! The following weeks of recovery were very reflective. I was under doctors’ order to stay put and limit movement; I had a lot of time on my hands. I began to reflect on my relationship with Sherri, and just how blessed I was to have such an amazing partner who was sticking by me, even though I wasn’t sure where I was going. I pondered on how much she trusted in her God, how deeply she felt about her faith, and just how much I yearned for that. It was at that moment that I remembered the book that Father Toomey gave me over three years earlier. I just had to find it! I just had to read it! As I began to read this book, I felt as if something began to sew up the empty hole inside of me. The words of the book turned into mental pictures, and pictures turned into feelings, and feelings turned into faith. Learning for the first time about Catholic Tradition with a capital “T” and apostolic succession just completely overwhelmed me. I was drawn to learn more! I told Sherri I had been reading Fr. Toomey’s book and expressed my desire to attend Mass with her. I know just how happy this made her! As I began attend Mass, an indescribable feeling took hold of me. That empty feeling — that hollow hole inside me — began to be filled. Before long, I realized that every single time I was at Mass, I was in the presence of Someone so much higher than myself, yet I could feel His yearning for me to be closer. There was no other place I would rather be! 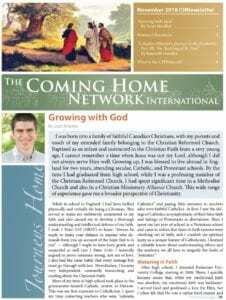 I came across information on the RCIA program, while researching how to become a part of the Catholic Church. I just HAD to do it and what an amazing and insightful journey it proved to be! I completed the RCIA program, and was welcomed into the Church on Easter Vigil 2010. Being able to take in the Body and Blood of our Lord Jesus Christ through the Eucharist is a moment that could never be put into words. I just thank my God for guiding me along on this journey and helping me see His face in so many people and events throughout my life! I currently serve as an extraordinary minister of Holy Communion in our local parish, which amazes me every time I serve. Coming out of an organization that attempted to limit my access to God, and into His, one, true Church where He dwells and is freely and readily available, fills that empty place I carried inside for years! Thanks be to God! Lou Everett lives with his wife, Sherri, in Indianapolis, Indiana. His two children Brenden (14) and Brianna (12) are an important part of his life. He has the honor of being part of the Christ Renews His Parish program, along with being part of the choir and serving as an extraordinary minister of Holy Communion. Lou is employed as a Computer Network Technician and Customer Solutions Specialist.